The blue-eyed anti-German "nazi-fighting" Irishman, Nicholas O'Donnell, who is on a crusade to see justice done for the Jews. 80 years ago, in 1935, some Jewish art dealers in Berlin sold a collection of medieval Christian relics, known as the Welfenschatz treasure, to one or more National Socialists “after they were unable to get a better offer.” The collection consists of dozens of gold and bejeweled relics that date to the Holy Roman Empire. Some of the precious artworks in the Welfenschatz collection (known in English as the Guelph Treasure) on display in Berlin. 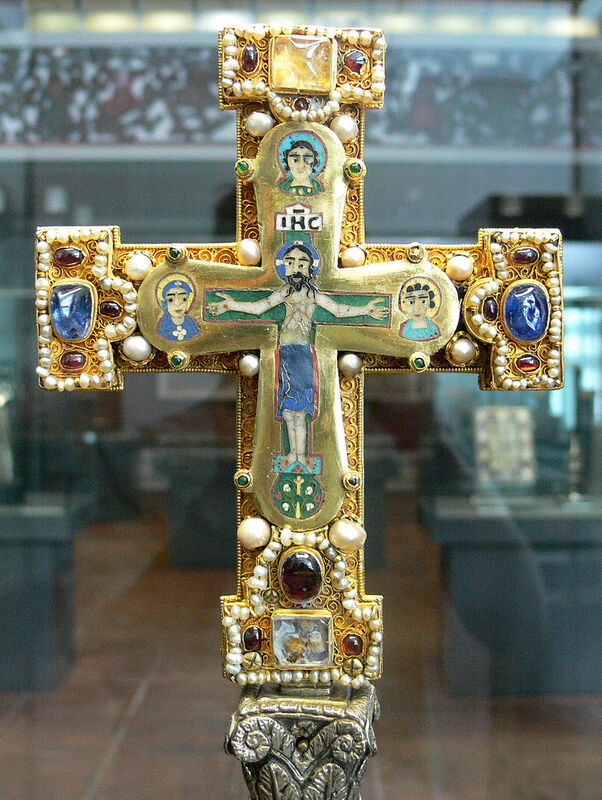 Below right: a cross from the collection. 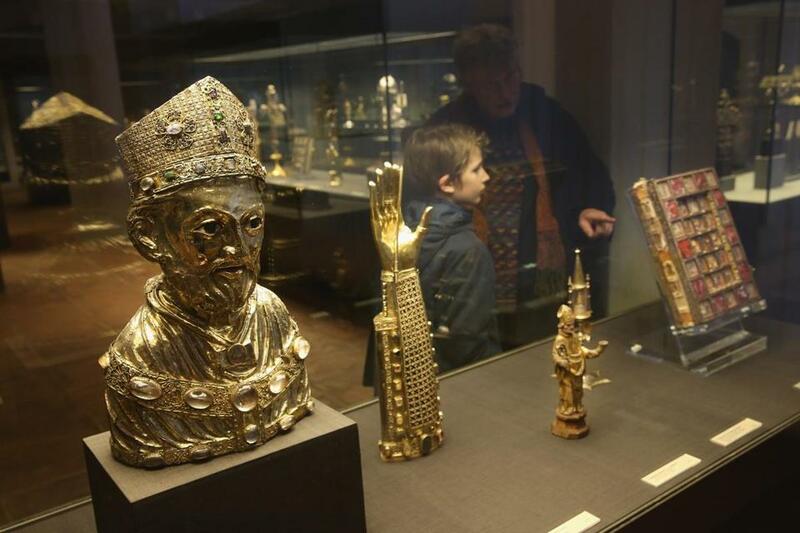 The collection of medieval ecclesiastical art was originally housed at Brunswick Cathedral in Braunschweig, Germany. Most of the objects were removed from the cathedral in the 17th century and dispersed in the 1930s. The Treasure takes its name from the princely House of Guelph of Brunswick-Lüneburg. 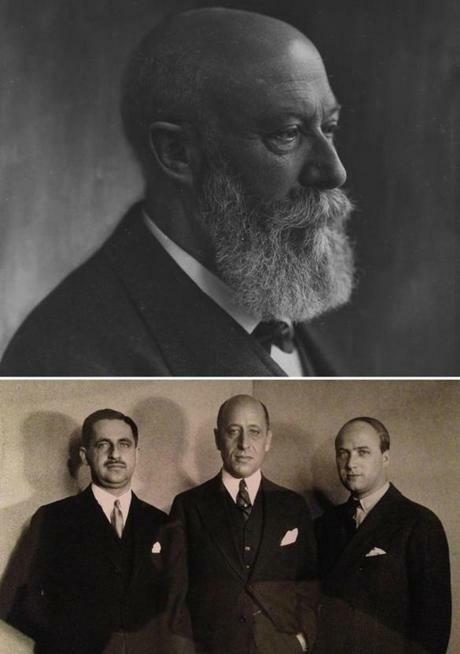 In 1929 Ernest Augustus, Duke of Brunswick, sold 82 items to a consortium of Frankfurt Jewish art dealers Saemy Rosenberg, Isaak Rosenbaum, Julius Falk, Arthur Goldschmidt and Zacharias Hackenbroch. Items from the Treasure were exhibited in the United States in 1930–31. Cleveland Museum of Art purchased nine pieces and more were sold to other museums and private collectors. In 1934 the remaining 40 pieces of the collection, which had been retained by several German-Jewish art dealers from Frankfurt, were purchased for 4.25 million Reichsmarks via Wilhelm Stuckart by the Prussian State under its Prime Minister Hermann Göring and displayed in Berlin. 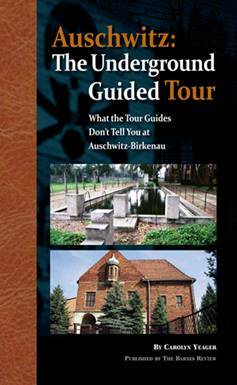 According to a Boston Globe story of July 15, a Boston attorney named Nicholas O'Donnell, a partner at the law firm Sullivan & Worcester, is helping a private American Jewish group try to get possession of this collection from the German government. Please see here for more information. The Jews legal complaint claims that the Nazis organized a boycott of Jewish businesses that quickly reduced the revenue of their ancestors firms to nothing. It alleges the transaction was made under duress for a cut-rate price. However this narrative is vehemently denied by German authorities, who say the sale was thoroughly reviewed by an advisory panel and found to be valid. The collection belongs to the German government and resides in the Kunstgewerbemuseum (Museum of Decorative Arts) in Berlin where it is on display. A German panel ruled in 2014 that there was insufficient evidence to prove the sale of the collection was influenced by the Nazis’ persecution. 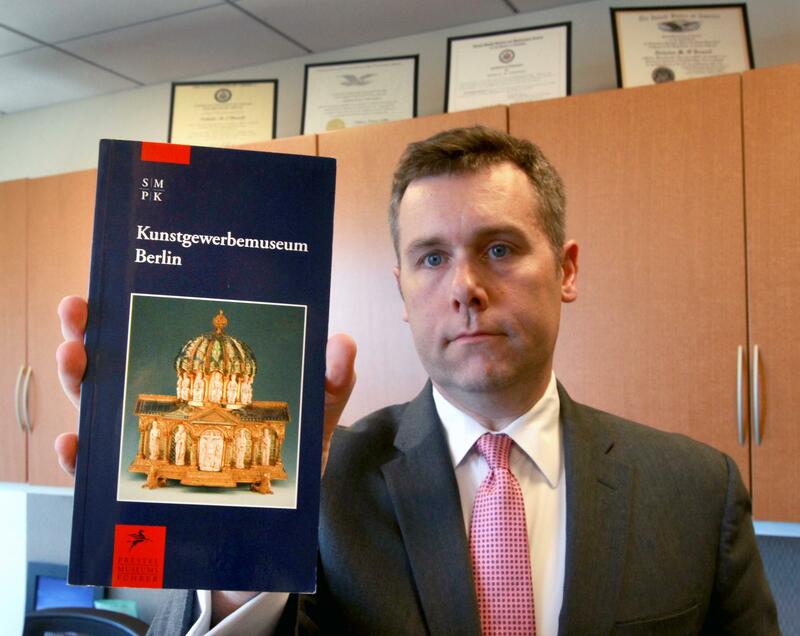 In response to the first US lawsuit brought by the American-Jewish “heirs,” the Prussian Cultural Heritage Foundation said the price was “fair and appropriate,” given the worldwide economic turmoil that undermined demand for pricey art collections. O’Donnell’s suit for his clients seeks to force the German government to return the $250 million treasure as restitution for alleged persecution under the Nazi regime. He said his clients are fighting for an acknowledgment that their ancestors were robbed of the treasure. The plaintiffs are only two, listed in the suit as Alan Philipp from London and Gerald Stiebel from Santa Fe, New Mexico. Of course, it's clear to us that they're fighting for $250 million dollars because they plan to sell the collection if they manage to get hold of it, just as their ancestors only wanted to profit from it. It was purely a financial investment for them, then and now. It goes without saying that Jews have no appreciation of Christian church art and symbols! All of this is meant to invoke images and ideas of Nazi terror. It is sad that a law firm with the names Sullivan and O'Donnell would play a part in it. And I just learned of a new twist: The matter is complicated by the fact that in 2013 the Israeli Government officially requested Germany to return the treasure to the petitioners!! Then they wonder why everyone wants them out of their countries. 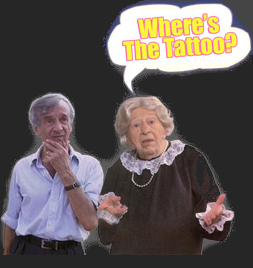 Plaintiff Gerald Stiebel is an art dealer! Turns out the plaintiff Gerald Stiebel is a fine arts dealer in Santa Fe, NM. www.stiebel.com the website of a fourth generation family concern dealing in a choice selection from a broad range of continental European works of art including old master paintings and drawings, sculpture, French 18th century furniture, German and French ceramics. 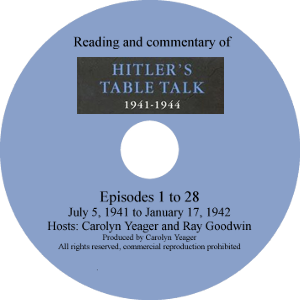 "It bears noting that some of the coverage, regrettably (and all of it in German, none of it below) has perpetuated long-promulgated stereotypes with references about Jews and money, or questioned why my clients would want “Christian” art, or challenging their victimhood because they were in the business of selling art." All very true (stereotypes or not) and I'm glad some Germans see the obvious here. But the hard truth of the matter is that this art was PAID FOR and now, 80 years later, they're saying their great, great uncles or whatever did not get enough for it. They obviously do not have a single statement from any of them that they were "forced" to sell. Jews causing trouble and expense for us, as usual. 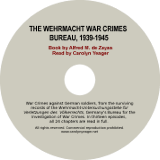 "In their suit, the plaintiffs say that the sale in 1935 "relied on the atmosphere of early Nazi terror, in which German Jews could never be arms-length commercial actors." There you go. Pushing the anti-nazi button in place of facts. This is a shame. Like Pirates, they probably spend their time looking for treasures that were once purchased or sold by these Jewish opportunists during that era in order to try and make some money today. I am willing to bet the original owner Ernst August wasn't given much by these opportunists compared to what they were worth and what they sold them for considering 1929 was the depression and a lot of people were desperate. They are trying to squeeze some money out of the German government because in the end they will probably get a settlement to just go away. Since they are considered priceless historic national cultural treasures all of the original pieces should be returned to the German Museum to be preserved instead of being plundered. This is the Ernst August, Duke of Brunswick who sold the treasure to the Jews. along with the other German kings, grand dukes, dukes, and princes. The next year, his father's British dukedom was suspended under the Titles Deprivation Act 1917 as a result of the Duke's service in the German army during the war, and Ernest Augustus' title as Prince of the United Kingdom was suspended under the same Act. Thus when his father died, in 1923, Ernest Augustus did not succeed to his father's title of Duke of Cumberland. For the next thirty years Ernest Augustus would remain as head of the House of Hanover, living in retirement on his various estates. I take it that since he was forced into "retirement", he became willing to sell this particular collection, for which he had no use, in order to support his "various estates". In 1929, he should have known better than to sell to Jews, but he put his own needs first. That is the history of how Jews got powerful in Europe - supplying money to the nobility and royalty. I don't see this Duke as any different. The National Socialists - Hitler, Goering, Stuckart, etc - should be thanked for purchasing what was still available from these shyster Jews and thereby returning it to the German people. This was a patriotic act! At this time, these Jews were in the process of trying to sell the whole collection. Since it was the Depression, they only sold about half in the US where they put it on exhibit in major cities in 1930-31. What kind of "Germans" were they? Not at all. So they sold the rest for what they could get in Germany -- maybe under a bit of pressure -- but certainly willingly. They had probably already made profit on it - we're not told what they paid for it. It's probably not known. To try to say now that what they sold still belongs to them (their heirs), as the digusting traitor O'Donnell is saying, is a form of blackmail based on the worldwide hatchet job that's been done on Germany's role in WWII. He gets away with calling the Germans selfish, greedy and guilty. Gerald Stiebel and Alan Phillip are the blackmailers now. I agree with you Carolyn. This lawyer is just not giving us all the facts. Here is a German article that I found dated Jan. 13, 2014 in the Berliner MorgenPost which goes into more detail. Just translate and it provides some details about the sales contract with Ernst August. It mentions that according to the sales contract the Jewish Consortium was not allowed to keep the treasures but to sell them. It says that from the sales proceeds the Jewish consortium of over 8 partners or more got to keep the first 7.5 mil RM and anything made after that they shared on a percentage basis with Ernst August. They sold some items before the October 1929 crash but after that no one wanted to buy. Sounds like they contacted the Germans to sell the remaining items since there were no buyers after October 1929. This article seems to cast doubt that the Jewish Consortium actually owned these items but were negotiating the sale. This is really a great find, alecti. 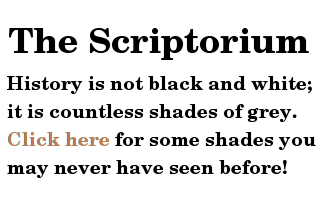 Rather than try to comment on it here, I'm going to write a new post for this information, so that people will be sure to see it.